So here it is, my brand new shiny series showcasing the gorgeous Timeless Elegance Designer Series Paper from Stampin' Up!. I have 7 different projects for you over the next 2 weeks and I really hope you enjoy them. I LOVE this paper and I can honestly say that its the first paper that I've ever used up the entire pack . I normally hoard paper I love, I just can't seem to use it. It's like I am saving it all for a rainy day. Well this time I decided just to cut into it straight away. And since I decided that, I just kept using it and using it in my projects. With all of my finished projects, I put them in my basket ready for photographing. Seeing them together made me realise that I had an opportunity to do another series.... so I added a few more projects so I had 7 in total - a few didn't make the cut but hey ho, we all know that when crafting things don't always look the way we envisaged them to. Some of the projects have been finished for a little while now and to be honest its been killing me having to patiently wait to show them to you. 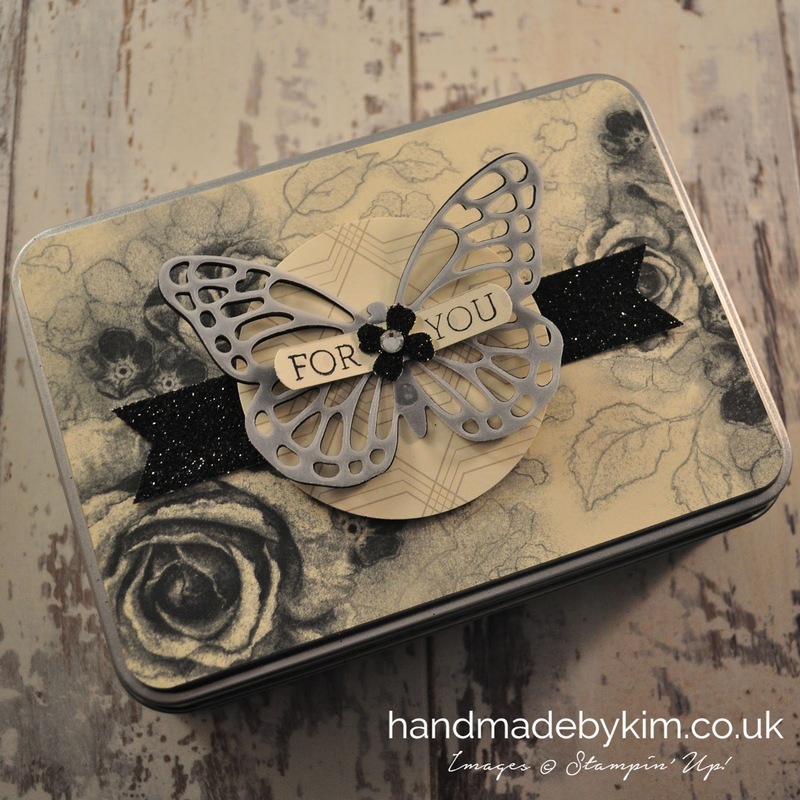 I am really excited to show you today this gorgeous stationery tin I've made. Isn't it just fabulous? Now I can't take credit for this gorgeous design, my upline Michelle Last created this as a project for our craft weekend in Birmingham way back in April. 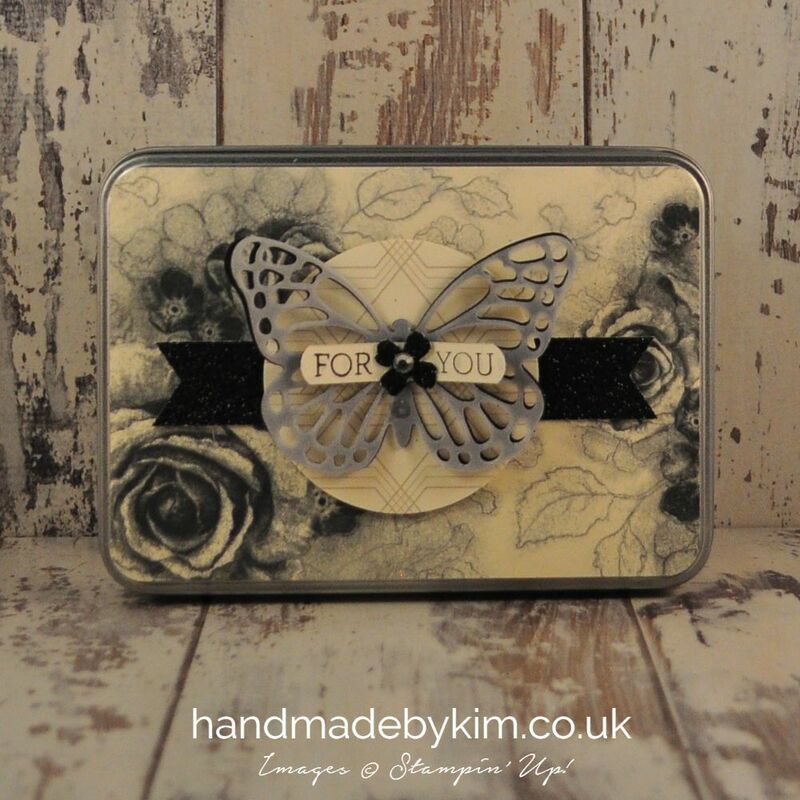 I've just taken Michelle's design and changed the colours to work with the Timeless Elegance Designer Series Paper. Click here to see Michelle's design. I love Michelle's version and still have my pink tin in my craft room along with the yellow version we also made. Even though they would make great gifts, I just can't seem to be able to part with them - and I am glad as they gave me the inpsiration to make this tin. You can buy these tins from Tinware Direct. 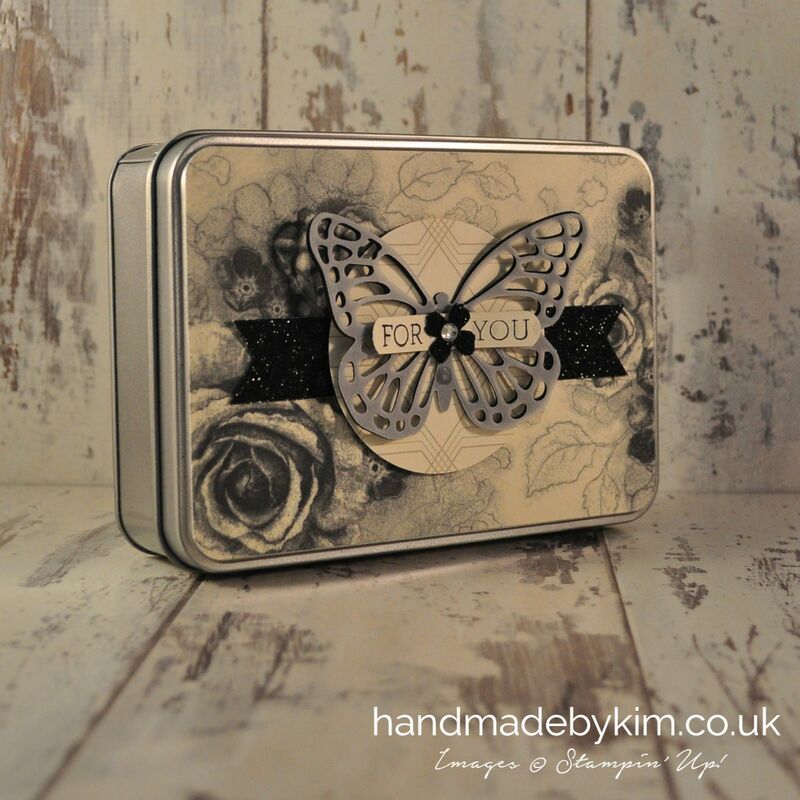 I think its amazing how you can transform a metal tin with some beautfiul paper and a few accessories. I've used Black Glimmer Paper for the Banner & Flower and Basic Black Cardstock & Vellum Cardstock for the butterfly. Still to come over the next two weeks I have a thank you card, a set of gift bags, a wedding card, the famous bag in a box, a congratulations card and to finish a pair of pillow boxes. Come back on Mondays, Wednesdays & Saturdays to see these projects or subscribe to by blog by clicking here.